On July 23, biologist Thomas Chiles (above, center), assisted by Mark Hasenauer ’11, recipient of an undergraduate research fellowship, and Fay Dufort ’06, a Ph.D. student, prepared an experiment to measure glucose uptake in cancerous cells. The work is part of a study funded by the National Institutes of Health to understand the molecular changes that allow such cells to acquire nutrients at extremely high rates. Chiles is also a member of a multi-disciplinary team at Boston College that is developing nanoscale biosensors for early identification of markers released into the bloodstream by cancer cells. 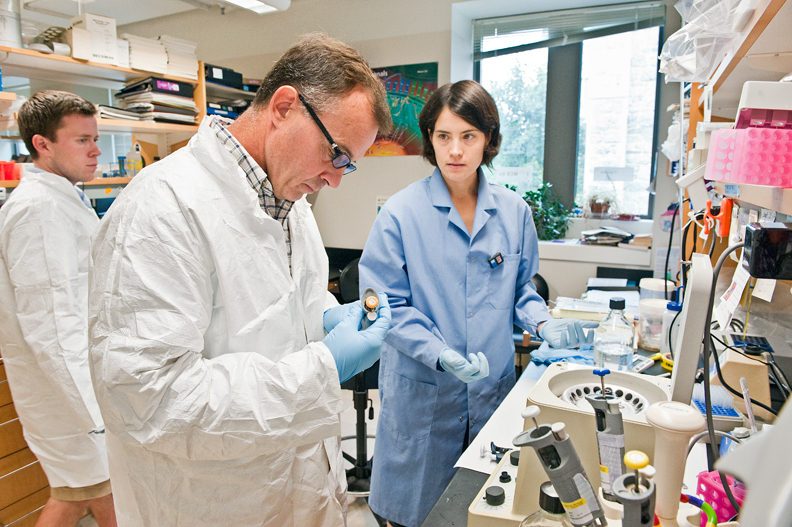 The project, supported by a grant from the National Cancer Institute, is an outgrowth of the University’s Institute for Integrated Sciences, which promotes collaborations among scientific departments. Aspects of this research, reported in the August 2010 issue of Nature Nanotechnology, involved members of the biology, chemistry, and physics departments. This feature was posted on Wednesday, August 11, 2010 and is filed under Featured Photo.